Looking for some fun Halloween treats and cocktails for your next holiday bash? Halloween usually aims to satisfy your sweet tooth, but before you go to the store and splurge on all the candy and chocolates, try some of these delectable, lighter party treats and cocktails that won’t leave your party guests looking and feeling like little jack-o-lanterns later. A simple, flavorful, and fun Halloween treat perfect for party guests! First, preheat oven to350 degrees. Cut 12 corn or whole wheat tortillas in a triangle, leaving the bottom uncut and roun d (to resemble the shape of a candy corn). In a small bowl, mix 3 tablespoons of salsa and 3 tablespoons of (low-fat) sour cream together. In a medium mixing bowl, combine 2 cups of diced roasted chicken, 1½ tablespoons of chopped green chilies, and the salsa/sour cream mix. Add salt and pepper to taste. Spoon 1/3 cup of chicken mixture onto tortilla and place corresponding tortilla on top. Place sliced cheeses on top to resemble candy corn pathttern with a white cheese at the tip (Monterey Jack or White Cheddar), dark orange cheese in e middle (mild or sharp Cheddar), and light orange cheese at the bottom rounded edge (Tillamook). Place the 6 quesadillas in the oven and bake until cheese is melted (about 5 minutes). Remove from oven, trim any extra cheese if desired, and serve. Try these mummified hot dogs that are sure to please and easy to make. All you need is 1 can of refrigerated crescent dinner rolls for every 8 large hot dogs (try soy dogs or a low-fat, low-sodium chicken sausage for a healthier choice). Cut each triangle in narrow strips of dough (strips should be a quarter of an inch in width) and wrap strips around the hot dog, starting at the base. When you reach the top of the hot dog, leave a separation for the mummy’s face. Place on ungreased cookie sheet or pan and bake for 12-15 minutes or until dough is light golden brown. Cool for 2 minutes and use a toothpick dipped in mustard (or another favorite condiment) to form two eyes. Dig in and enjoy! Slice off the top of a navel orange and hollow out the interior by scooping out the orange segments. Carve a pumpkin face on one side of the orange and repeat for other oranges. Dice up your favorite fruit (including the orange segments) and fill each cup. Set the lid back on top and serve. Although this is made with white chocolate (only half an ounce each pop), it’s much healthier than candy, andcertainly a frozen Halloween snack for all to enjoy! For an even healthier version, you can substitute white chocolate for yogurt. All you need is 1 medium banana, 1 cup white chocolate (or yogurt), 8 mini chocolate chips (for the eyes), and 4 popsicle sticks. Cut eat each banana in half lengthwise, then in half to make 4 quarters to yield 4 boo-nana pops. Insert popsicle sticks into bananas and freeze on a wax paper lined cookie sheet prior to dipping in melted chocolate (easy way is to microwave chocolate in coffee mug for 30 seconds at a time, stirring until chocolate is soft and melted). Add chocolate chips for the eyes before chocolate hardens. For this fun easy snack, you will need 12 slices of your favorite cheese, 12 pretzel sticks and 12 fresh chives. 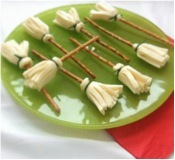 Fold eachcheese slice and cut the fringes of the broom using a pair of scissors. Roll the slice of cheese around the pretzel stick so that the fringes are hanging down like a broom. To keep the cheese in place, wrap the chive around the stick and tie it. Simple as that, enjoy! Who says Halloween is just for the kids? Try these fun Halloween Cocktails for your next costume party! One of these intoxicating drinks contains 3 ounces of Pisco Brandy, 1 ounce fresh lime juice, 1 ounce fresh lemon juice, 1½ tablespoons granulated sugar, crushed ice, dash of Angostoria bitters, and dry ice for the spooky effect of wispy smoke that emulates the long, flowing gown worn by La Llorona. In a cocktail shaker filled with crushed ice, combine brandy, juices and sugar. Cover and shake vigorously for 15 seconds and strain into a cocktail glass. Top with a few drops of bitters and add dry ice. (Note: Dry ice is safe to use in drinks, but be sure to wait for the ice to melt before actually drinking it as it can burn your skin). All you need for this drink version of a tasty treat include the following – 1 quart of chilled apple cider, 1¼ cup spiced rum, 2 tablespoons of fresh lemon juice, and 1 red apple, thinly sliced. I a large pitcher or punch bowl, combine the cider, rum, and lemon juice and chill for up to 12 hours. Serve over ice and garnish with the apple slices. Try this delectable drink for your next party mixer. Combine 1 tablespoon of sugar, and 1/8 teaspoon of pumpkin pie spice on a small plate. Dip the rim of a chilled martini glass in water, then in the sugar mix to coat. In a martini shaker filled with ice, combine 3 tablespoons of vodka, 2 tablespoons of half and half, 1 tablespoon of canned pure pumpkin puree, 1 tablespoon of maple syrup, ¼ teaspoon of pure vanilla extract, and 1/8 teaspoon of pumpkin pie spice. Shake vigorously and then strain into prepared martini glass. This sweet-tart drink will be sure to pack a punch at your next Halloween bash. Combine ¼ cup sugar and ¼ cup water in a small saucepan. Cook over medium heat, stirring often, until sugar is completely dissolved, usually in 1-2 minutes. Let it cool. In a large pitcher or punch bowl, combine ½ cup Campari, ½ cup of gin, ½ cup of fresh-squeezed orange juice, and the sugar-water mix. Chill for up to 12 hours. 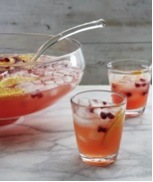 Just before serving, add 3 cups of chilled club soda, ½ cup of pomegranate seeds and 1 thinly sliced orange. Serve over ice. Fill a glass with ice and pour ½ cup of ginger beer and 2 teaspoons of fresh lime juice. Float 3 tablespoons of dark rum onto the ginger beer by slowly pouring the rum over a metal spoon turned upside down. Garnish with a lime wedge and enjoy the deep, intense flavors of this dark and spooky cocktail.